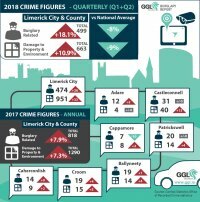 The CSO has released its latest quarterly crime figures and, taking the first two quarters of 2018 into account, there were 499 burglaries and burglary related offences in Limerick city and county in the first half of 2018. The same period last year had 420, showing an increase of 18.8%. This is in contrast to the national average which shows a reduction of 8%. 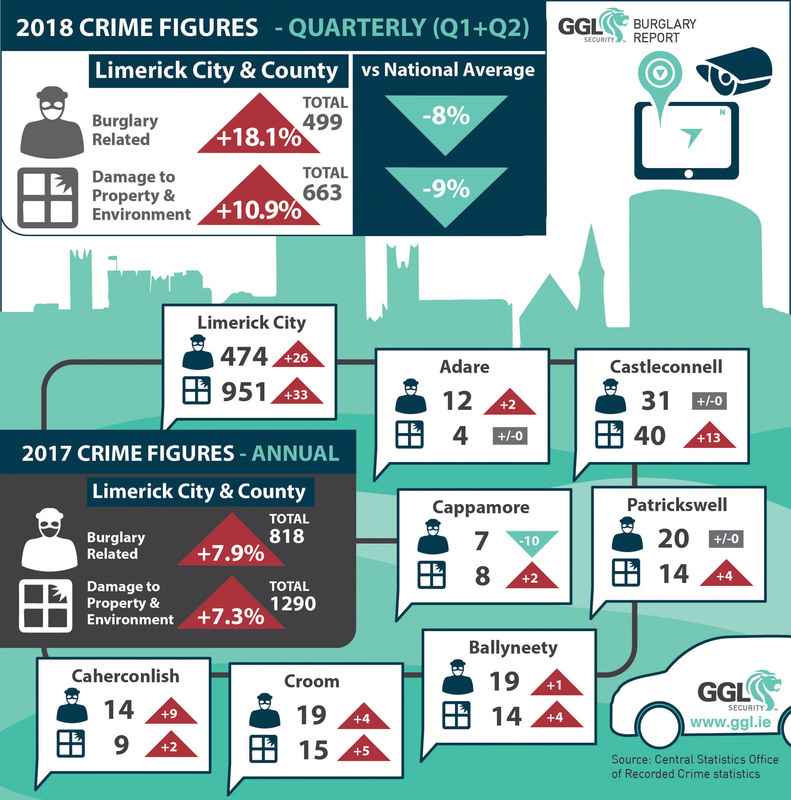 Damage to property and the environment in Limerick saw an increase to 663 offences for the first six months of 2018, in comparison to 598 similar offences for the same period in 2017, an increase of 10.9%. This was again in contrast to the national average which showed a reduction of 9%. While a breakdown of figures for the different stations within County Limerick were not yet available for the current year, the CSO annual figures published for the previous years showed burglary related offences for Cappamore at 7 for 2017, reduced from 17 the previous year; Castleconnell at 31, the same number for 2016; Adare at 12, up from 10 the previous year; Croom at 19, increased from 15; Ballyneety at 19, up from 18; Caherconlish at 14, up from 5; and Patrickswell remained the same at 20 for both years. Limerick City had 474 burglary related offences, up from 448 in the previous year. Overall, there were 818 burglary related offences recorded in 2017, up on 758 from 2016 with an increase of 7.9%. Annual figures for damage to property and the environment offences across the county saw Cappamore at 8 in 2017, up from 6 in 2016; Castleconnell had 40, up from 27; Adare had 4, the same as the previous year; Croom had 15, up from 10; Ballyneety had 14, up from 10; Caherconlish had 9, up from 7; and Patrickswell had 14, up from 10. Figures for Limerick City saw 951 offences related to damage of property up from 918 the previous year. In total, Limerick City and County recorded 1290 offences relating to damage of property and the environment in 2017, up on 1202 in 2016, an increase of 7.3%.